Over the 20 last years, the increase in sow’s prolificacy has been associated with a decrease in average birth weight and an increase in within-litter variation of individual birth weight (Quiniou et al., 2002), writes Nathalie Quiniou Ifip-Institut du Porc, France. At the same time, milk potential increased but not appetite, which resulted in more important mobilization of body reserve during lactation. Hence the benefit of additional extra piglets born was not completely recovered at weaning due to increased rate of losses or impaired reproduction performance after weaning. Solutions that would help to increase performance of prolific sows are awaited by pig farmers. One of them consists in changing the management of the herd toward a weaning at 3 weeks instead of 4. But this is not so simple to do and even sometimes not allowed in some countries. Then, while genetic selection is working on improving the maternal ability of sows, the improvement of nutritional supplies at the different physiological stages of the cycle are investigated. For decades a lot of studies have been carried out to characterize the requirement in essential amino acids (eAA) and energy during gestation and lactation periods. The first step was to determine the nutritional values of dietary ingredients, and presently most of pig diets are formulated based on the standardized ileal digestibility of eAA and net energy (NE) systems (INRA-AFZ, 2004). Then, as far as eAA are concerned, the second step was to take into account the balance among AA in body protein and their efficiency of utilization for protein retention. This resulted in the ideal protein concept with specific profiles during gestation and lactation based on lysine, threonine, methione+cystine, tryptophan, and more recently valine and isoleucine. In a context of high prolificacy and an expectation for an improved sustainability of pig production, AA nutrition has to be more precise than ever, more than it was with conventional types of sows, in order to enhance performance of sows without detrimental issues on environment and production costs. The AA were originally considered by nutritionists as substrates for protein synthesis and retention, but more recently attention has been paid to their role as intermediate substrates for the synthesis of crucial molecules involved in the efficiency of some organs or functions, themselves involved in fetal development for example. Up to recently, a single diet was used for all sows over rather long periods, either gestation or lactation. Then precision feeding will have to consider the evolution of requirements with time over each physiological stage, the evolution of the balance among eAA or between eAA and NE, but also the differences in requirements from one sow to another. Models can be interesting tools for determination of nutritional requirements and calibration of dietary supplies based of average performance level of the herd. But to achieve precision feeding, equipment and software will be required to develop data collection at the animal level and precision feeding devices to supply the right amount of nutrients to the right sow. 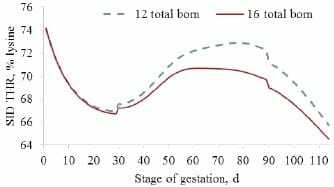 Dynamic of eAA requirements during gestation. The development of the litter occurs mainly during late gestation and is associated with a very important increase in eAA requirement. As long as litter size was limited, it was possible to meet the requirements in eAA at the end of the gestation with a constant allowance of a given diet all along the gestation. Presently, it no longer possible (Figure 1a) and it is better to adapt the daily nutrient allowance toward higher supplies at the end of the gestation in order to limit the deficiency in nutrients (Figure 1b). This can be achieve through a modification of feed quantity and/or quality. When the feeding management is changed from a constant daily feed allowance toward a U plan for example, this must be applied to the sows at the beginning of gestation, not to those who are closed to the end. Otherwise the total feed allowance will be increased and sows will be fatter at farrowing with increased risks of problems at parturition. In other words, the proposed change in the feeding plan concerns the dynamic of feed allowance not the total feed allowance, so that excess is reduced at some stages and the corresponding amount of spared nutrients is reported at other stages to reduce deficiency. In Figure 1, the changes in daily supplies are performed only through changes in daily allowance of a single gestation feed. As the U plan provides more energy during late gestation, protein retention increases as well as lysine requirement but deficiency is reduced a little bit. A further decrease in deficiency could be achieved through a more important increase in daily allowance or an additional increase in a two steps strategy, but at the condition that the feed allowance at the middle of the gestation did not become to low, otherwise placenta development may be impaired (Noblet et al., 1985). Figure 1: Modelling the evolution of the lysine requirement during gestation with InraPorc® software and comparison with supplies with a single gestation diet using a constant plan (a) or a U plan (b). From a comparison between sows fed either with a constant plan or receiving 800 g/d more feed two weeks before farrowing (anticipated by a decrease in feed allowance from Day 14 to Day 100 of gestation), Quiniou (2005) observed that more sows farrowed without any help (Constant Plan: 71% vs Increased Plan: 84%, P < 0.05), and that farrowing process was improved (Figure 2). In this study, more feed was provided during late gestation, i.e. more eAA, more NE, more minerals... A companion study was performed in which only more energy was supplied during late gestation (Quiniou et al., 2008) without any advantage in the farrowing process. However, extra energy provided over this period can be interesting when the sow is not too fat, as it can help to increase the energy content in colostrum and thereafter can improve the survival rate of smallest piglets through a better thermoregulation. In Figure 1, nutrient requirements are simulated from an average profile of crossbred Large White × Landrace sows, characterized at the herd level. According to this average profile, it would be interesting to reduce even more the excess in eAA supply during early and middle gestation perhaps through a change in feed quality. But this would be a very bad idea because when the daily supplies are based on the requirement of the average profile then it implies that the requirements of only 50% of sows will be met, i.e. whose requirements are below the average profile. Consequences of this approach have been investigated in growing pigs by Brossard et al. (2009), who observed a decrease in average daily gain and an increase in feed conversion ratio at the batch level when supplies were at 100% of the requirement of the average profile. From modelling requirements of a population of pigs, Brossard et al. (2014) observed that growth performance of the group was maximized when supplies were 35% higher than the requirements of the average profile, and that the economic return was maximized also with an increase in supplies above the average profile depending on the price context of feedstuffs. Feeding the individual sows based on the requirement of the average profile at the beginning of the gestation will prevent the sows who had mobilized intensively their body muscle during the lactation from recovering during early gestation. In addition, sows who have mobilized intensively their muscle during lactation often retain more protein during the following gestation than expected when requirements are estimated. And this is possible only when supplies are high enough, otherwise those sows would be unable to recover and probably culled rapidly. Consequently, during early and middle gestation, the advice is to maintain the dietary eAA content at a higher level than what would be expected from the average profile at these periods, assuming that the average profile is established from data collected both from sows and gilts. At the end of gestation, the average profile seems not pertinent any longer, and an increase in AA content should be performed specifically. If it is not the case, AA supply does not meet requirement of some sows and of most of gilts. Using a different diet over this period is also interesting because the balance between eAA and NE requirement increases as well, which is not compensated by an increase in daily allowance (Figure 3). Figure 3: Modelling the evolution of the ratio between lysine and net energy (NE) requirement during gestation with InraPorc® software and comparison with supplies performed with a single gestation diet formulated at 0.55 g/MJ NE using a constant plan (a) or a U plan (b). Dynamic of the ideal protein. Not only the ratio between Lysine and NE intake changes with time but also the ratio among eAA. The concept of ideal protein that has been used for more than 20 years now is based on the ratio of eAA in protein required for maintenance or tissue accretion and the efficiency of utilization of eAA. For a rather long time, the profile of the ideal protein has been rather stable at each phase of the physiological stage, either gestation or lactation. Yet, different compartments develops according to specific kinetics during gestation. Then different types of protein are retained which profiles in eAA differ, and their contribution to whole protein retention depends on the stage of gestation, litter size, maternal growth or muscle recovering. Thereafter, based on the stage of gestation and estimation of the protein retention and the tissue where proteins are retained, the model proposed by NRC (2012) to estimate the requirement in different eAA allows for considering the ideal protein in a more dynamic way that it was previously done. Then for example when the sow is restrictively fed according to a U plan, it appears that the relative supply of threonine to lysine is very high at the beginning of gestation but progressively decreases (from 74 to 67% at 30 days of gestation) when the muscle recovering occurs, then it increases at the middle of gestation when contribution of maintenance to total requirement is high up to a value that depends on litter size, and finally decreases again during late gestation when fetal development is very important (Figure 4). As soon as dealing with the precision supply of lysine will no longer be difficult the concept of the dynamic ideal protein will be much more crucial than presently. Effectively, when the lysine supply exceeds the requirement with a single diet or a 2- phase strategy, the concept of ideal protein is less relevant as other eAA can be also supplied in excess even if the ratio with lysine does not meet the best profile. The difficulty in applying the concept of precision feeding during gestation is that assessment of eAA relies on an expected BW gain (or more precisely muscle gain) and on an expected litter size and weight at farrowing. But it is not possible to predict very closely litter’s characteristics at birth, and sows often recover more muscle than expected. Then the challenge is to implement tools to assess the dynamic of sow’s characteristics. Otherwise, misestimating the composition of BW gain will impair the performance if not combined with a security margin. Individual variation of eAA requirements during lactation. During lactation, the sow is unable to eat enough to meet her very high nutritional requirements. In most cases, when they are fed ad libitum, it is difficult to increase the energy intake through an increase in dietary energy content. But it is possible to adapt amino acid contents to milk potential and feed intake in order to prevent from excessive body muscle mobilization, resulting in reproduction problems and heterogeneity of the next litter. This is usually done at the herd level, but difficult in practice at the sow level. When only one diet in used during the gestation and another one during lactation, dietary amino acid concentrations remain stable even though requirements change on a daily basis and among sows (Figure 5). Some farmer are ready to use a specific lactation diet for primiparous sows. For a given litter size, young sows produce around 10% less milk than older ones, but eat around 15% less. Therefore their lactation diet should be more concentrated in eAA. But more generally, as there is a variation in daily feed intake among sows, different dietary eAA concentrations are required to meet requirements of sows that produce the amount of milk. Then, some farmers are interested in precision feeding tools that would help to improve the adequacy between supplies and requirements in amino acids at the individual level. Figure 5: Estimation of daily digestible lysine requirement according to the model proposed by Dourmad et al. (2008) from individual litters’ characteristics (average size during lactation and daily gain) when suckled by first (n = 345) or fourth-parity (n = 261) sows (on average over 28 d of lactation, Quiniou, unpublished data). Researches have been performed for almost 20 years now to deal with variation in daily feed intake or growth potential of pigs in modelling of their nutrient requirements (Knap, 1995; Pomar et al., 2003; Strathe, 2009; Vautier et al., 2013). It is clear now that nutrient recommendations cannot be based on requirements estimated from the average performance of the group of pigs (Pomar et al., 2003; Quiniou et al., 2013) otherwise requirements of half of the animals that are above the average profile will not be met and overall performance impaired. Then, recommendations are basically established as a proportion of the average requirement that incorporates a safety margin (10 to 15% depending on feed cost, Quiniou et al., 2013) or, in a more elaborated way, are directly based on the structure of variation of the population. Such an approach was recently extended to the lactating sow (Strathe et al., 2015) and can be interesting in order to formulate a single diet for all sows or to adapt dietary supplies based on individual requirements, including individual pattern over time during lactation according to the concept of precision feeding. Functional amino acids and quality of piglets at birth. Conditionally essential AA corresponds to AA that presents a rate of utilization greater than synthesis under some conditions. Arginine, cysteine, glutamine, proline and tyrosine are concerned in the NRC (2012) inventory. As some physiological functions depend on the availability of these amino acids and result in important, and sometimes transient, increase in their concentration in some organs, they can also be called functional amino acids. Recently, research focused on arginine and glutamine for example. Example of arginine: Arginine is an intermediate substrate involved in placenta angiogenesis and growth. The digestible arginine to lysine ratio should be above 53% during gestation according to NRC (2008), or slightly higher when requirement for fetal protein deposition is only considered (58%, from Trottier et al., 2015). Usually, gestation diets are rich enough in this amino acid (above 120% of digestible lysine in usual French diets), but very high concentrations of arginine are observed locally like in allantoic fluid at specific stages of development (multiplied by 23-fold between D30 and D40 of gestation; Wu et al., 1996). The interest of an extra supply of 20 to 25 d/d of this amino acid has been demonstrated in early (day 14 to 28 of gestation) or mid-gestation (day 25 to 53 of gestation) on litter size either expressed in total born (Ramaekers et al., 2006) or born alive piglets (Che et al., 2013) or viable fetuses (Bérard and Bee, 2010). In conventional sows, prolonged supply (from Day 22 or 30 to farrowing) improves also the number of piglets born alive, either through more total born piglets (Gao et al., 2012) or reduces stillbirth rate (Mateo et al., 2007). In contrast, in prolific sows with more than 13 total born piglets per litter and supplemented from day 30 of gestation or later until farrowing, the increase in litter size at birth is not significant (Bass et al., 2011; Quesnel et al. ; 2014; Garbossa et al., 2015) even if numerically above the control diet. 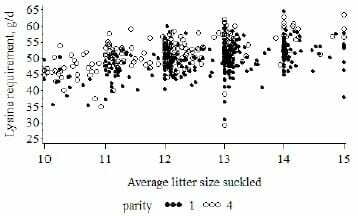 Nevertheless, all of the authors who report a significant or numerical increase in prolificacy observe that the increase in litter size is not associated with a decrease in average birth weight, whereas it is usually the case when litter size increases (Quiniou et al., 2002). Such a result would be in agreement with the better placental vascularity reported by Wu et al. (2006) or increased placental weight (Bass et al., 2011; Gao et al., 2012). This probably contribute to the reduced within-litter variation of birth weight (Quesnel et al., 2014, Table 1) or the smaller proportion of small piglets (i.e., weighing less than 1 kg, Che et al., 2013) under arginine supplementation. Such a result is very interesting in a context of high prolificacy, as nutritional solution are no longer sought for more piglets at birth for more vigorous ones. Example of glutamine: This AA is the most abundant free α AA in the body as well as in most of pig diets. It is involved in many regulation processes. Most of the dietary glutamine (or its precursor glutamate) is metabolized by the absorptive cells of the small intestine and, in the young animal, it contributes to the maturation of the digestive tract after birth. Under normal situation, the synthesis by the animal is high enough to meet the requirement of the animal. Under stress exposure, the ADFI usually falls down and there is an important utilization by the digestive tract and inflammatory tissues, immune cells, kidney… resulting in a rapid decrease in body concentration that may impair some physiological functions. This explains why glutamine is presently considered as a conditionally essential AA by the NRC (2012). No precise knowledge of its requirement is still available. This AA is not included in the recommendations by NRC (2012) but studied through dietary supplementations of grade feed glutamine or sources of glutamate. No data seem to be available when more glutamine is supplied through changes in the type of feedstuffs used in the diet or changes in their incorporation rates. As very high concentrations are observed in the fetal plasma and milk (Wu et al., 1996), trials have been carried out recently, especially in Brazil, to increase even more these concentrations in order to help the newborn piglet to cope with sanitary challenge after birth and to improve survival rate at weaning. During lactation, the sow is most often in a catabolic state as the dietary ingestion is too low to meet the nutritional requirement for milk production. Muscle catabolism occurs to compensate for the unbalance between dietary AA intake and requirement in essential AA for milk protein synthesis, and some glutamine is released from the protein breakdown. The aim of the feeding strategy during lactation is to use diets rich enough in essential AA (g/kg) and to stimulate the ingestion level (kg/d) to prevent from an excessive loss of muscle mass (<15% according to Clowes et al., 2003) to avoid reproductive problems after weaning or reduced litter size at the following parturition. However, in most cases, some muscle mobilization occurs at least because energy stored in muscle is mobilized to meet energy requirement for milk production. In such condition, release of glutamine makes it difficult to demonstrate the benefit of a dietary glutamine supplementation on litter’s performance. However, despite the high capture by the digestible tract, an increase in glutamine concentration has been reported in milk and to a lesser extend in colostrum (Manso et al.,2012; Santos de Aquino et al., 2014) after a supplementation, which may help improve the intestinal health of piglets as demonstrated through gavage of glutamine under experimental inflammatory challenge (Watford, 2014). Taking into account the global context of high prices for protein rich feedstuffs and the consideration of consumers for environmental issues, the amino acid supplies have to be performed in the more efficient way as possible. The right amount of nutrients provided to the right animal on the right day is the aim of precision feeding. Compared to the old times when eAA were supplied through crude protein contained in seed meals, the combination between synthetic sources of eAA and feedstuffs allows for a reduction in dietary crude protein content for a given eAA concentration and profile that considers now at least seven eAA. The safety margin dwindles for some of them and the requirement estimation is crucial to ensure that performance are maintained. The knowledge on this topic is rather large but still increasing toward more and more precision at the individual level and in a dynamic way. Increasing knowledge on functional AA may lead to specific supplies at specific stages of the reproductivecycle. Development of new devices in a close future will help meet the challenge of implementing this scientific knowledge in pig farms. You can view the reference list by clicking here.